Did you know our company is a full service General Contractor, capable of Mobile home removal and new manufactured home set up services? 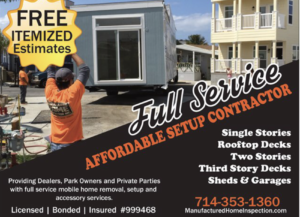 It’s True, we have a full team, dedicated to removal of old mobile homes and installation of new custom manufactured homes. 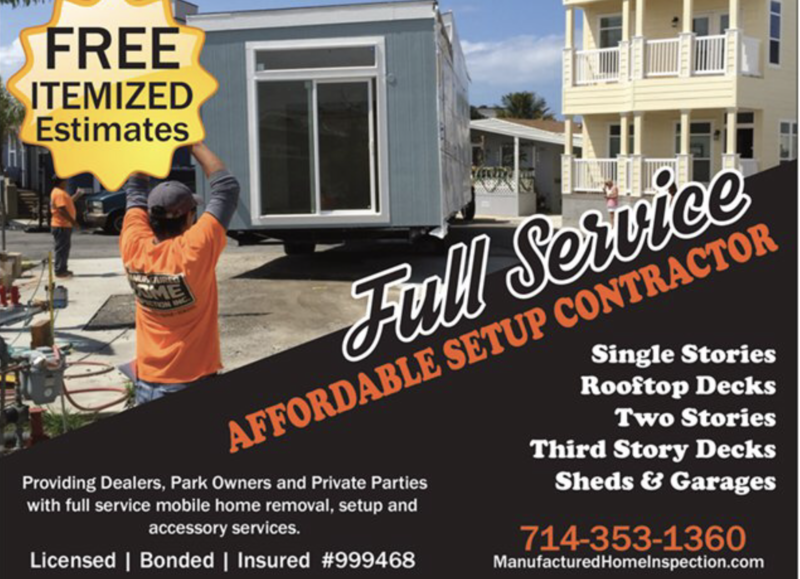 Our expertise is is single wide home installation ,double wide manufactured homes, triple wides, roof top deck manufactured homes, two story manufactured homes and two stories with a third story roof top deck. Our team can handle everything on your new home project. How do you remove an old mobile home? One of our consultants will need to visit the home site and assess the condition of the old mobile home. We will need to look at the roof, the interior, the under carriage and the outside landscaping and concrete work. We will then assess the time involved to remove old awnings, planters, trees, sheds, concrete, sidewalks and steps. Our mobile home consultant will look underneath the home to inspect the condition of old axles and tires as well. Sometimes those have been removed and will need new axles and tires installed before the home can be pulled out. Once that assessment is complete, our consultant will give you a written estimate for the cost to separate the old home into individual chassis, remove the skirting and awnings and haul away the home. Sometimes you can get paid for the old home and send it to mexico where it can be repurposed. What happens after the old mobile home is removed? Once the old mobile home is removed from the lot, it will be necessary to send in a demolition crew with a bobcat and clear everything from the lot. The demolition crew will remove and haul away all old debris from the mobile home lot. The old sheds, driveway, sidewalks, porches, patio enclosures will all be removed and hauled away. The only thing that will remain is the utilities. Once the site is cleared and cleaned, the manufactured home installation team will review the dimensions of the new home that is being installed. They will measure the entire lot and decide where the new home will be installed. at that point they will prepare road base in the area where the new home will be installed. That road base will raise the grade so no water can drain under the new home. Once the road base is installed and compacted, the new home is ready for delivery. Now you are ready for the new manufactured home to be delivered. We handle the process of obtaining all necessary permits and approvals by park management. Our team will coordinate directly with the mobile home dealer you bought your mobile home from, like Mobile Home Agents, our sister company. We will need to review the purchase agreement and see which factory your new home is being made in. The factory usually takes 8-12 weeks to make the new custom manufactured home. We will also correspond with the transport company who will be delivering the new manufactured home from the factory to the new manufactured home site. Once the home is built at the factory,it is then shipped to the site and our team will arrive that day of delivery to coordinate exactly where the home will be parked. Now that the manufactured home is delivered, our crew will use rolling jacks to align the two halves and connect them at the floor and roof marriage lines. Once the home is in perfect position, we install all required and approved piers under the home that lock to the chassis. We wil also install the required tie down system at necessary locations around the perimeter of the home. The next step in setting up your new manufactured home is to connect the main utilities to the park, this includes water, gas, waste and electric. Finally its time to close it all up at the roof, the inside drywall, the floor and the skirting. It’s now ready for inspection by the Department of housing Manufacture Home Installation inspector. Now that the home is setup and inspected, you will receive a certificate of occupancy from HCD which allows you to move in, but it may still need finishing touches. At this point we can install carport awnings, porches, brickwork, air conditioners, flooring, custom tile shower surrounds, custom countertops, rooftop decks, garages, custom steps and more. There are virtually unlimited options you can do to your new home and the lot. Our team can handle it all. We often have requests for vinyl fencing around the home, custom mobile home sheds, manufactured home garages and built in outdoor barbeques. Once all the construction is complete, you can schedule the movers and get settled in to your new manufactured home and enjoy al lof its amenities.